Researchers from Ecole Polytechnique Federale de Lausanne (EPFL) made an interesting energy discovery recently. They found it’s possible to make a small, eco-friendly device that packs a more powerful punch than you might expect using nothing more than cardboard, Teflon tape, and a pencil. The system relies on static electricity to generate power. The device is made with two cards of paper that are covered with a layer of graphite carbon (pencil lead) on one side, attached with Teflon tape in the shape of an arch. 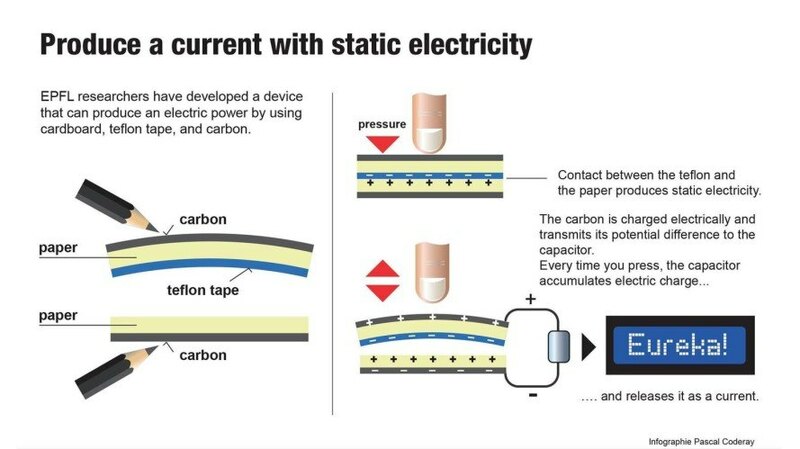 The paper and tape both act as insulators, with the carbon serving as electrodes. When pressure is placed on the device, the two sides connect, creating a positive charge on the paper and negative charge on the Teflon. As the cards separate, an electric charge builds on the carbon layers. University of Tokyo researchers have already improved on the device, using sandpaper on the cards to create a rough surface that boosts output more than six times. It may not look very impressive, but this new discovery is actually pretty promising, especially in developing regions that might not have access to batteries or electricity. Not only is this a power source that’s incredibly easy to create with household items (which could not be said for earlier, similar generators), it could be used in portable electronics at a low cost, eliminating the need for conventional batteries. This simple power generator could replace batteries in small, portable electronics. This diagram shows how the low-tech electricity generator works.